Take an easy day trip from New York City to Boston with this round-trip rail tour. Includes a hop-on hop-off trolley tour, which takes you to the many historical sites and shopping meccas that make up Boston. Don't forget to try the New England Clam Chowder -- best when you have it right here in Boston. Train tickets, the trolley tour and a 2-course lunch are all included in the price. Enjoy a Dine4less card during your stay in New York. Take the kids for a one-day experience of one of the USA's oldest cities, Boston. 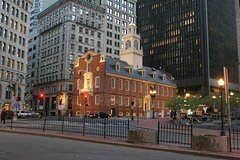 Founded in 1630, over 100 years before the Declaration of Independence, Boston was the site of the beginning of the Revolutionary War and three of the Declaration signers are buried there -- Samuel Adams, John Hancock, and Robert Treat Paine. After a relaxing railroad trip from New York, enjoy a tour around the city, where you can hop on and off to see the many sites including Boston Common, the USS Constitution, Faneuil Hall, the Old State House and so much more. See the story, the ships and more at the Boston Tea Party Ships and Museum. If you're a sports fan, take a side trip to see famous Fenway Park, home of the Red Sox. With all that touring, you'll enjoy your included 2-course lunch at Hard Rock Cafe with Priority Seating. Go to the front of the line and show the hostess your voucher and you'll be escorted to your seat in no time. After a memorable day like this, the kids will be fast asleep on the evening train back to New York City. Enjoy a Dine4less card during your stay in New York.